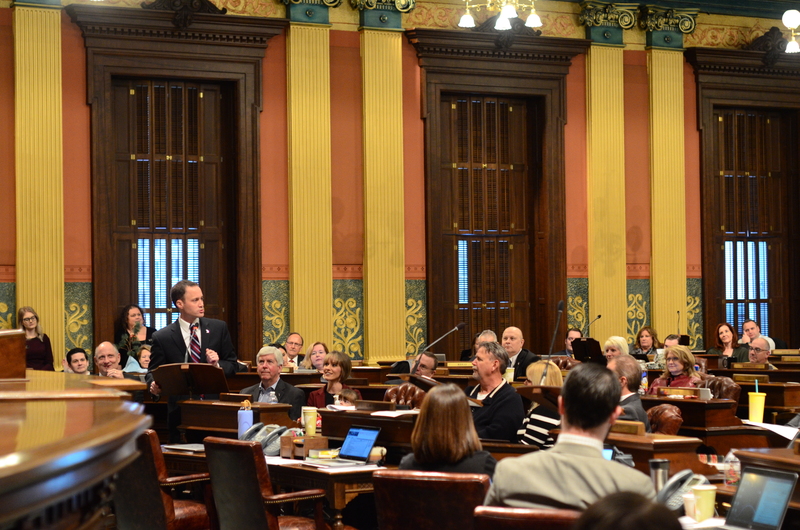 During a marathon session Thursday night, outgoing state House Speaker Tom Leonard (R-DeWitt) delivered his farewell speech, touting improved mental health care access and elimination of driver responsibility fees as his top accomplishments. The term-limited speaker mounted an unsuccessful run for Attorney General in 2018. Gov. Rick Snyder was there for his speech Thursday. Leonard pointed to the bipartisan House Community, Access, Resources, Education and Safety (CARES) Task Force from earlier this year as one of his proudest accomplishments. Leonard said that improved mental health care access stands is “a big deal to me” and something that is “near and dear to my heart.” The program, he said, helps reduce the prison population for those with mental illness. Additionally, Leonard pointed to the elimination of the state’s driver responsibility fees program, which wiped out nearly $650 million in debt from about 350,000 drivers in the state and get their driver’s licenses back. Leonard also used the occasion to touch on his relationship with outgoing House Minority Leader Sam Singh (D-East Lansing). While sitting on different sides of the aisle from each other, Leonard said that Singh was one of the few people in Lansing he trusted implicitly, noting the partisanship that has washed over the Capitol city in recent years.